There are abundant parking options in Old Town Pasadena. There is a parking lot adjacent to my office located at 48 N. Raymond Avenue. Metered parking is available along Raymond Avenue, Arroyo Parkway and Colorado Boulevard. From the 110 Freeway heading north - the 110N Freeway converts to Arroyo Parkway in Pasadena. Continue on Arroyo Parkway until you reach Colorado Boulevard. The building is on the northwest corner of Arroyo Parkway and Colorado Boulevard. From the 134 Freeway heading West - exit the 134E Freeway at Fair Oaks Avenue North / Marengo Avenue. Merge onto Maple Street. Take the 1st left onto Marengo Avenue, then a right onto Colorado Boulevard. The building is on the northwest corner of Arroyo Parkway and Colorado Boulevard. From the 134/210 Freeway heading East - exit the 210W Freeway at West Colorado Boulevard. 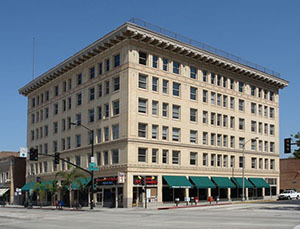 The building is on the northwest corner of Arroyo Parkway and Colorado Boulevard.